It is amazing as a Father, something that I find absolutely adorable will eventually cause me great amounts of stress. They were there as soon as she was born. They had an overwhelming melting effect on me when they were a mere few seconds old. Now since they are almost 7 years old, I find them to still have their stronghold on my heart. What I fear is the day they do the same to someone else. 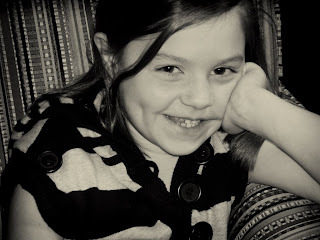 So today's picture is of what I saw when I came home from work tonight, Madison's dimples.